The Stove and Fireplace | Chimney Sweep Kent £45. Chimney Sweep and Stove service in Kent. At The Stove and Fireplace, we offer a high-quality professional chimney sweep service in Kent. No matter the size or shape of the chimney, we can take care of it quickly and efficiently. That means no mess and a chimney that is working to keep your home warm and safe. Birds love chimneys because they are warm and secure. But that doesn’t mean they should nest there. Bird’s nests can cause havoc, not to mention a lot of mess. That’s why we recommend an annual ‘check-up’ for your chimney. Please remember it’s important to get your chimney swept to keep within your warranty for your wood burning stove. It is vital that your chimney is checked to see if it is drawing clear, and as soon as we have cleaned it we include a free smoke test. This gives you peace of mind because you know it is clear and safe. The smoke test, while not being an incredibly complicated procedure, can only be carried out by professionals. Usually, something is burnt at the base of the chimney to establish some kind of a draw on the flue. Alternatively, other special equipment may be used to simulate a draw for the flue to bring. Then, smoke pellets are used. Again, this is left to professionals, because they will know exactly how many are required and how they are to be used. Our experience in this matter is substantial, and we have used smoke pellets as part of the smoke test for many years. Once the pellets have started smoking, the area is covered up. The cap of the flu is covered up as well, and then the chimney is checked for any areas of leakage. This can take some time considering the size of the chimney, and the work that has been done. However, it is part of the safety procedures when the chimney is cleaned. We know quality counts, so we will issue you with a certificate once the work had been done. This includes notification of our public insurance, which insures against £2 million. We feel it is important to present absolute transparency to our customers. That is why we will show you the certificate and give you a copy of notification that the work has been finished. The notification about public insurance is also important to us because it reassures you that we are professionals who care about the work that we do and will back up the effectiveness of that work. The sweep service is popular, and we do recommend it does happen on a regular basis. Keeping your chimney clean is an act of responsibility, and it also adds to the general health of your building. 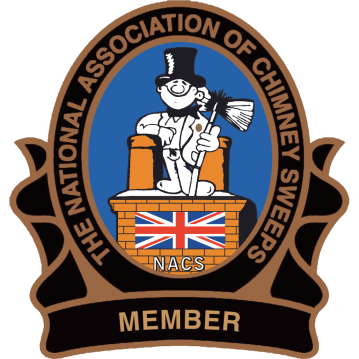 Our sweeps are a member of the Institute of chimney sweeps or the national association of chimney sweeps (NACS) so you can be assured of a professional sweep every time. Maidstone, Rochester, Chatham, Gillingham, Sittingbourne, Sheppy, West Malling, Allhallows, Snodland, Halling, Snodland, Gravesend, Meopham, Istead Rise, Meopham, Rochester, Strood, Cuxton, Larkfield, Kings Hill and all surrounding towns.